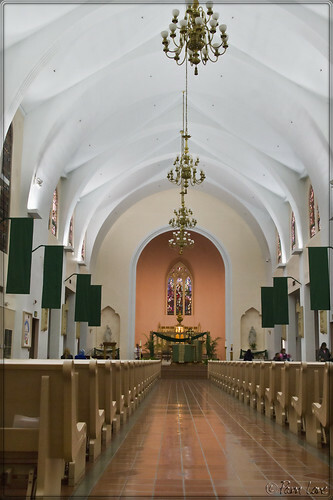 We've posted quite a few pictures taken at Our Lady of Perpetual Help, a beautiful Catholic parish built in 1909. Yesterday, I happened to pass by when the front doors were open. I stopped and met Father Joseph, who welcomed me to take some pictures inside as soon as Mass ended. The inside was as beautiful and peaceful as the outside. 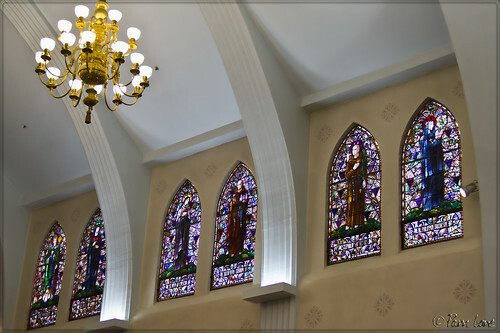 What I was most curious about was what the large circular stained glass window in the front looked like from the inside. 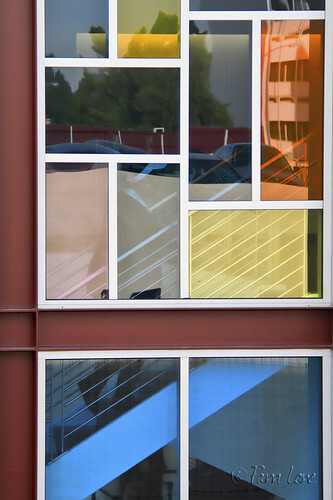 (Click here to see the window from the outside.) I was disappointed to find that, at least with yesterday's overcast skies, no light at all shone through from that side. Instead, these windows on the side walls were nicely lit. I've always loved horses. But the closest I've ever gotten to having a horse of my own was back in my college days when I shared the board for my friend's horse in exchange for riding rights. It only lasted a few months, but I was in seventh heaven. 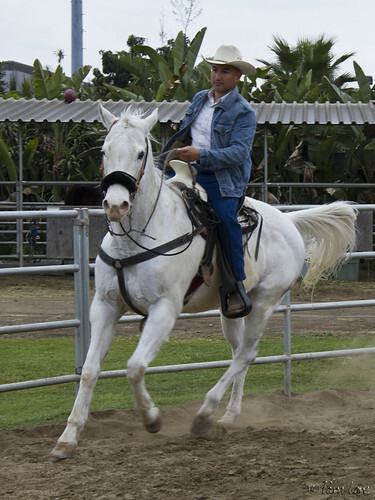 We boarded this horse at the Imperial Equestrian Center in South Gate, just west of Downey. 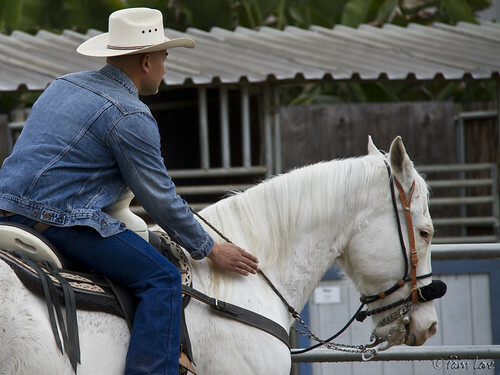 And for a while, I watched Nicholas train and ride his beautiful white horse. 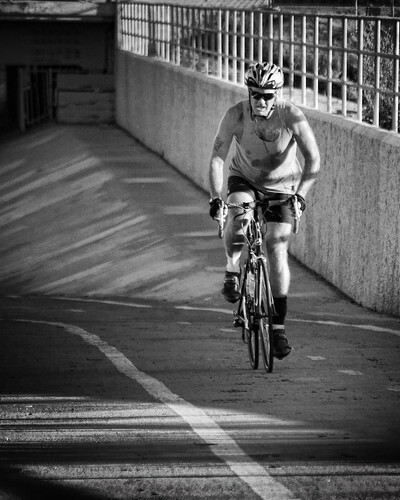 It's enough to make me want to ride again! A door or a gate? I have always been drawn to doors. There is something compelling about them that beckons me. This door has both a sense of peace and inquiry. I want to know what is behind the door...there is an implied secret, an adventure that intrigues me. I was on my way to work the morning of January 28, 1986, the morning that the space shuttle Challenger exploded on take-off. It was one of those events—you know, like when JFK was shot, where you remember where you were when you heard the news. During the 1970s and 1980s, four of the space shuttle orbiters, Columbia, Challenger, Discovery and Atlantis, were constructed at the North American Rockwell plant in Downey. 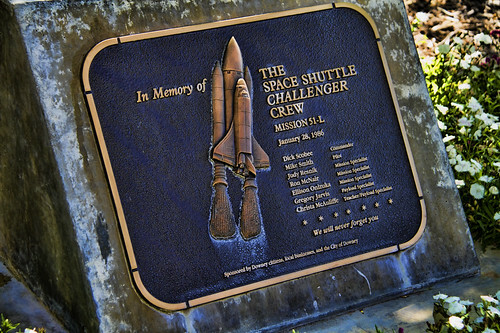 Twenty-five years after the explosion, this plaque by the Downey Civic Center reminds us of the seven astronauts who lost their lives. 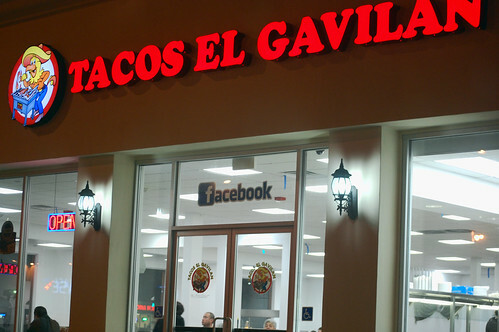 Not exactly a hole in the wall, this Mexican restaurant is new to Downey but very popular. And no surprise. It is clean, friendly, and best of all, dollar tacos! If they had one of these open when I was in high school, I would have gone everyday. 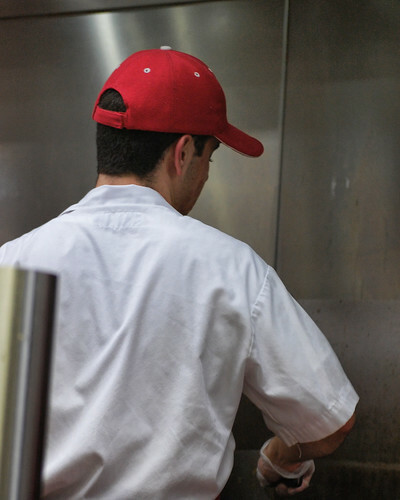 You can place your order and then pile on whatever toppings you desire as they cook it right in front of you. 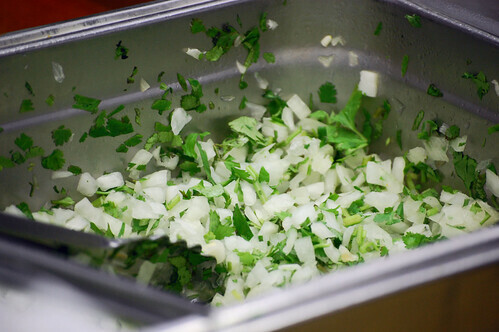 My favorite are the onions and cilantro together, with a little lime of course. 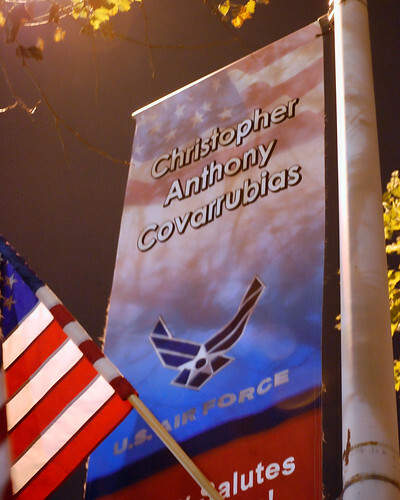 One thing I really love about downtown Downey is the pride we have displayed in the flags honoring our own soldiers. It is a small gesture for their sacrifice for their family, friends, and country. 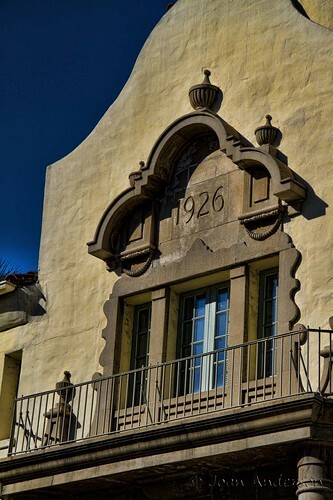 This traditionally Spanish-style building was apparently built in 1926. I love the look and the details (if you zoom in on the small picture to the right, you'll see some of the great architectural details). I'm not sure what it was originally, other than part of the hospital/medical center campus. 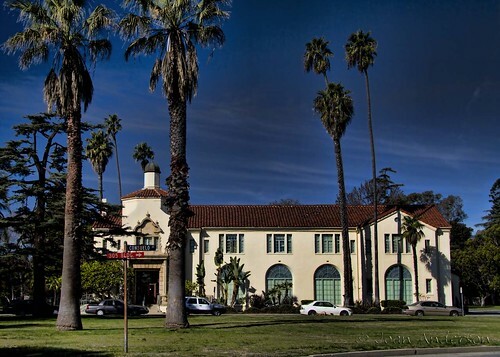 Today it is a Los Angeles County Office of Public Safety. It is one of the few buildings located on the south campus of Rancho Los Amigos Rehabilitation Hospital that is actually in use. The 70-acre area is odd in that most of the buildings are abandoned and boarded up. I find it hard to believe this area has remained abandoned for such a long time. 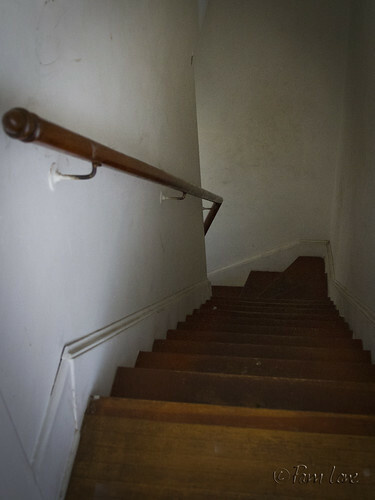 There are stories to be found everywhere that talk about it being haunted... I don't know about that, but driving through the area does give you a feeling of loss and abandonment. See previous posts for another peek at this intriguing area. 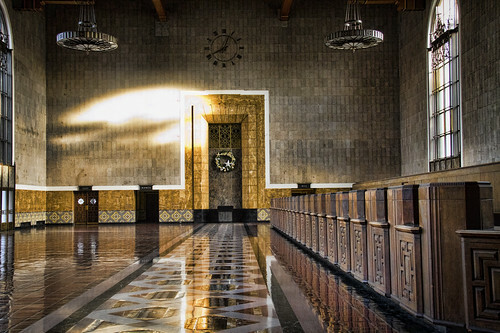 The Los Angeles Union Station is about 12 miles (or 17 minutes with no traffic) from Downey. For a college student taking the train home for the weekend from Santa Barbara (about 90 miles to the northwest), this is where you get off to meet your ride home. Union Station opened in May, 1939. 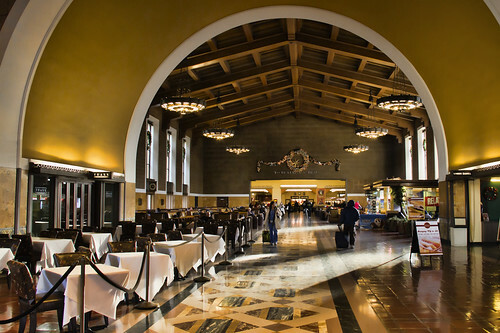 The grand hall, above, was originally the ticketing hall. The waiting room and elegant dining areas, below, conjure thoughts of romantic cross-country trips more than of the daily commute to the office. 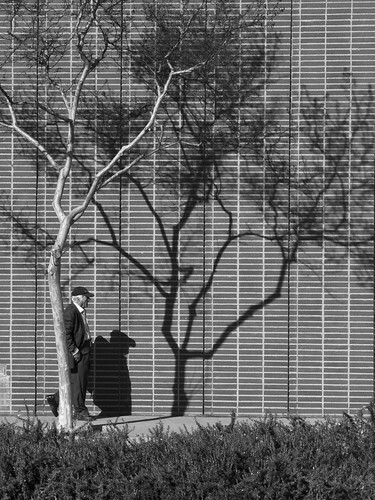 The other day I noticed this tree and its shadow, outside of the empty Von's Market. When I went back the next day to take its picture, this old man kindly walked into the frame at just the right moment. Aloha! The name of the store is Exotical. It is a combination of exotic and California. 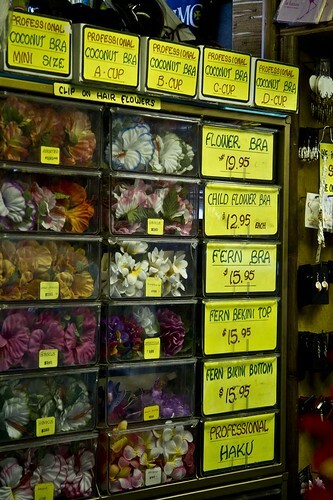 I have seen this store on Firestone Blvd. for as long as I can remember, but I've never visited it before today. One of the things I have loved about doing this blog has been the people we meet and the stories, the history we learn. I love that everyone has such an interesting story to tell. 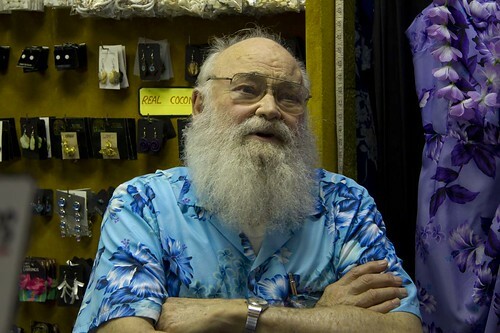 John Paul Orloff has owned Exotical for 46 years. 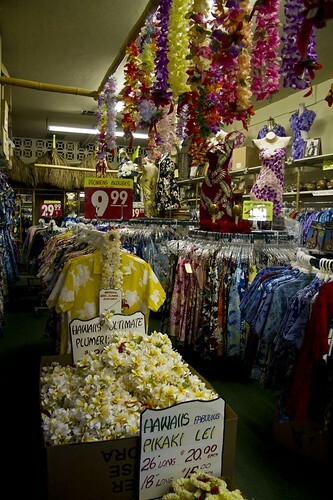 The store has a large selection of Island imports, from resort clothing, to leis, to ukeleles made out of coconut shells — and much more. Paul welcomed us to his shop. He clearly loves people and chatted with us for some time. He is a born storyteller and we were regaled with stories from his past. After a while, he pointed out to us that he had written everything down in the form of a book — his memoirs. As the son of Russian immigrants, Paul has an interesting story to tell. By the time I left, I had a copy of Paul's book — his gift to me. It was a sweet moment, meeting him and spending a little time getting to know the man behind "Exotical." 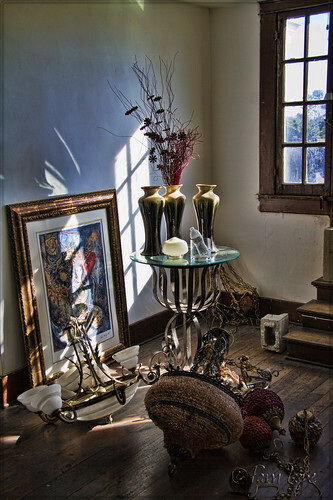 Technically, the Rives Mansion has a third-floor ballroom, but right now, it functions more like an attic, a place to store those things you don't have a place for but can't get rid of. 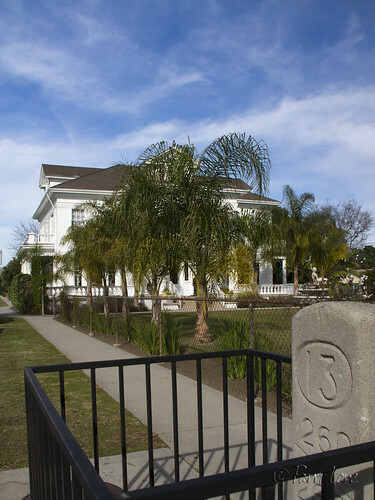 For more posts about the Rives Mansion, click here. I'll admit it. 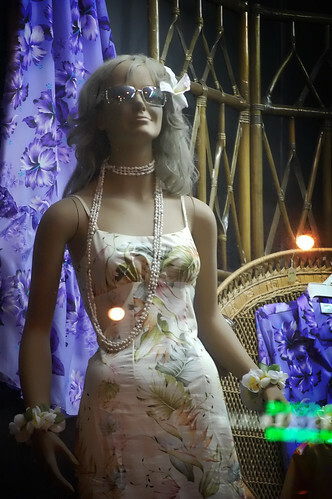 I was taken aback by this image of the Hawaiian store front last night. But the more I looked in the windows, the (somewhat) cuter every thing became. If you were going on your honeymoon to Hawaii and wanted to match your husband, you totally could. They boast the best puka shells around so I'll have to go in and see for myself. 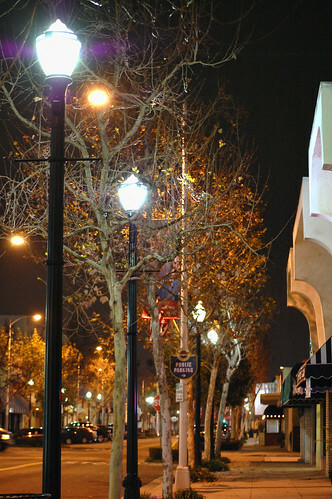 As I walk the streets of downtown Downey, on a cool night in January, I notice something. As in, no one is around, anywhere. This is downtown. The place where everyone is supposed to hang out, drink coffee, browse the shops, check out what's playing at the dollar theater, or other night life activities. Except, there isn't really anything to do. There is a billiards a couple streets away and a few coffee shops across town and the Krikorian is farther away than one would like to walk. I feel Downey is like a compilation of good intentions thrown together without any kind of organization or true planning. Like we boomed in the middle of last century and now are kind of stuck there, adding a few new pieces here and there. We need some new ideas for all the vacant shops surrounding downtown. For the past year we have posted pictures taken in Downey, after all, our blog is Downey Daily Photos. But Downey is sourrounded by so many other cities with many interesting sites, we thought we would throw in a few now and then. So, here goes...this is a view of downtown LA, entering the city via surface streets. 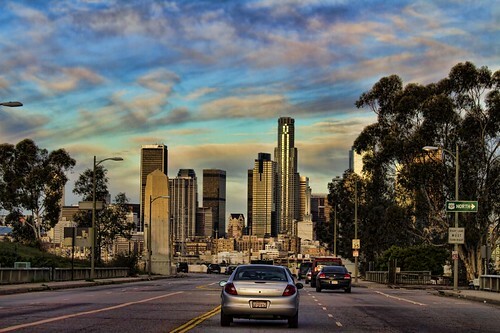 I have always been drawn to the skyline view of the city — and I loved how the city popped into view as we were driving in along Whittier Blvd. 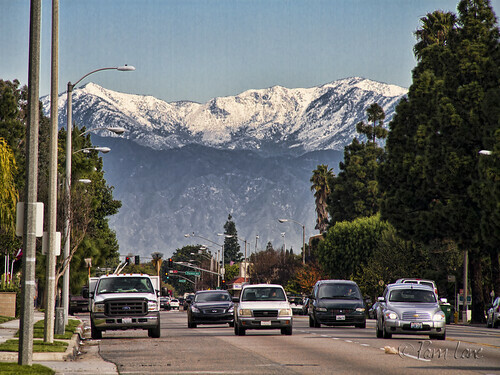 Many people don't realize how close Downey is to downtown Los Angeles. 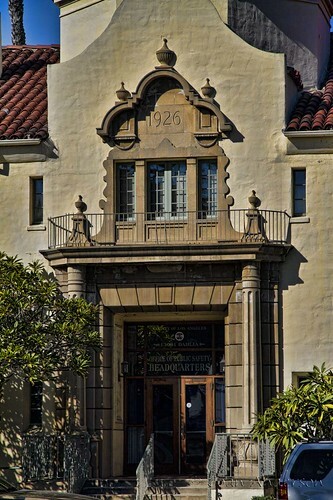 In fact, there is a historical marker (placed in Downey in 1908) on the sidewalk by the Rives Mansion that indicates that the distance from the corner of 3rd Street and Paramount is 13 miles to the Los Angeles County Courthouse. I pump my own gas because it's cheaper than the alternative. But at least I used to be able to sit in the car listening to my book while the tank was filling. A while back, though, my nozzle's "hold open" latch didn't work. I thought just my nozzle was just broken, but a look around confirmed that everyone else was also standing at the pump squeezing the handle. It turns out that the "hold open" latch on nozzles from Vapor Systems Technologies have a malfunctioning switch. (The affected nozzles have the VST logo on the side.) 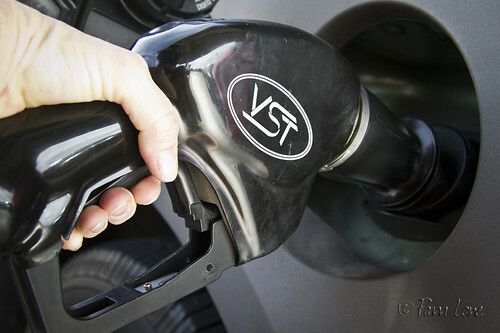 As a result, the state fire marshal has ordered the removal of the "hold open" latches on VST gas pump nozzles statewide, including at my local gas station. You can read more about the problem here. Maybe it's all for the best, for me at any rate. According to wikiHow, "Be careful about getting in your car while gas is pumping. This generates static sparks, and is the #1 cause of gas station accidents." 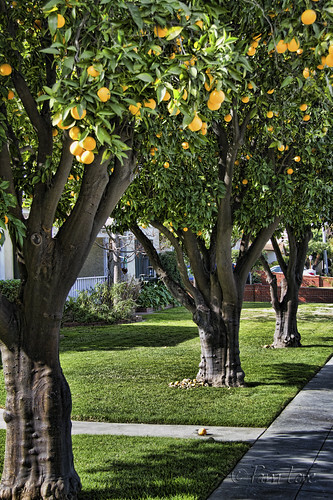 I live in a section of Downey referred to as the Orange Estates. You can understand why it's called that when you see the multitude of orange trees heavy with ripe fruit at this time of year. Very few people actually collect the oranges to eat. 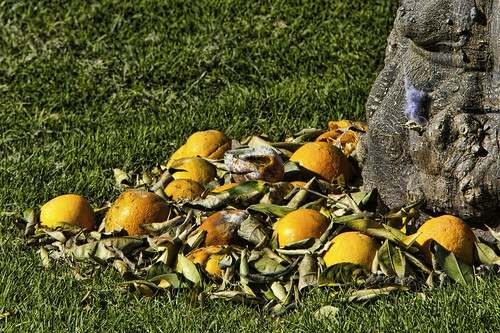 Piles of rotting oranges are very common. Riding home from the dog park this morning, I met Rebecca. She was working in her garden. 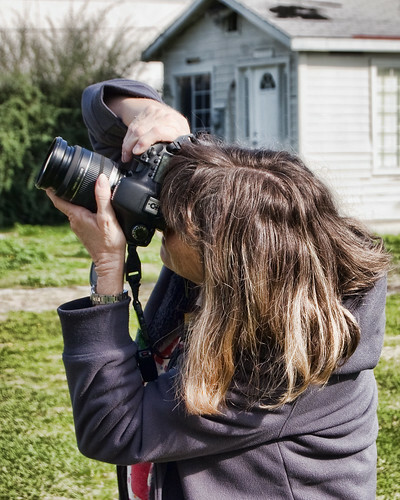 Both her front and back yards are gardens that are an eclectic mix of plants, stones, statues, birds, turtles, you name it — objects she has collected over the past 30 years. 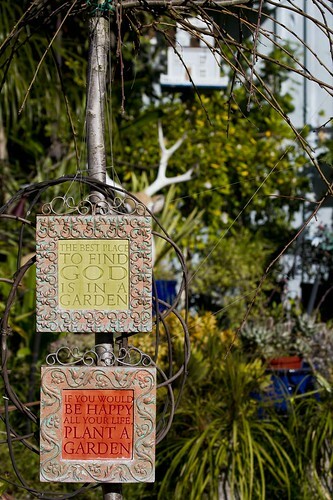 It made for a charming, diverse garden of color and texture. She told me she was initially motivated years ago when water was in short supply and she was trying to create a space that did not require as much. 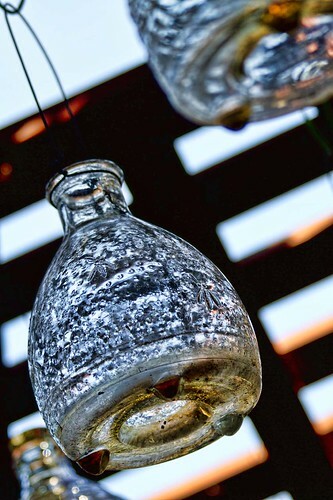 I loved her collection of wasp catcher bottles, no longer in use, that she hung from her small gazebo in the back yard. 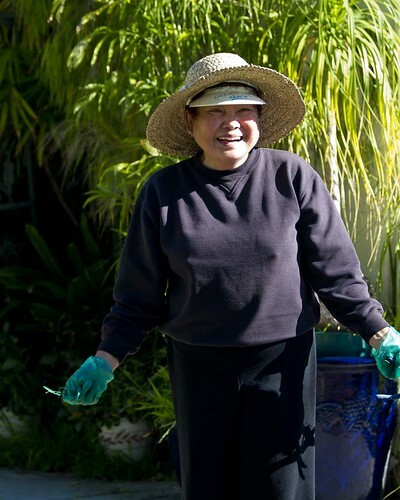 It was a fun encounter, Rebecca was so welcoming... letting me wander and make myself at home in her garden. From the top of Downey's newest downtown parking structure, next to Porto's Bakery, you can watch a Porto's employee walk upstairs to take a break, or you can see the reflections of the parked cars and of Downey's oldest downtown parking structure in the background. My, how downtown Downey is growing! I think the quote says it all. It's fun, hard, childlike, freeing, strengthening, invigorating, and inspiring. It is something every adult should do at least once in a while. It isn't an exciting door. It isn't even a pretty door. But it is old. A century old, really. 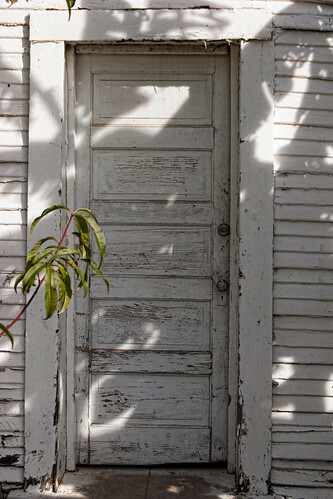 It is the door going to an old tower on the Rives property. Speculation as to what he actually kept in there ranges from grain to his own water recourse. 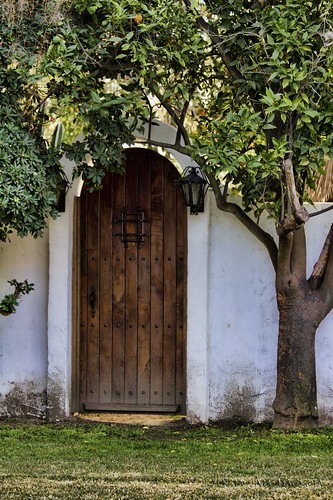 I just love the fact that that door was used regularly by people before we even existed on this earth, who went through their day to day lives not thinking that this door would ever be used in a blog, on the internet, one hundred years later. Okay, so they didn't get out, they were actually in — the Rio San Gabriel dog park, that is. The dogs were having the time of their lives and we had a lot of fun watching them play. Specifically the Great Dane and the little brown one. They made great playmates. 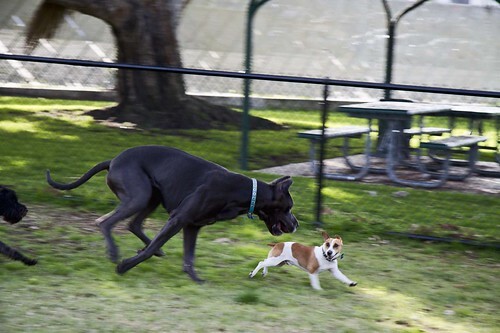 They would race around the "big dog" area with the small one trying to keep ahead of the chase and the Great Dane who was so careful not to squash the little one. 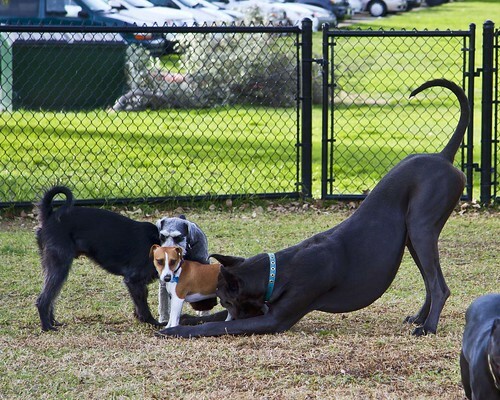 Every time they would stop, the Dane did this playful bow. It made him seem regal and sweet all at the same time. When James Rives built his mansion in 1911, his plans of course allowed for his live-in kitchen staff. 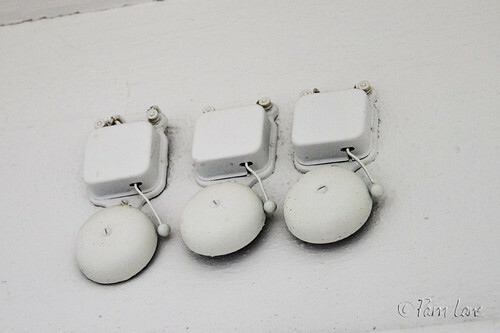 From the small bedroom on the second floor that overlooked the grounds in the back, the servants were summoned by these bells at the top of the stairs. 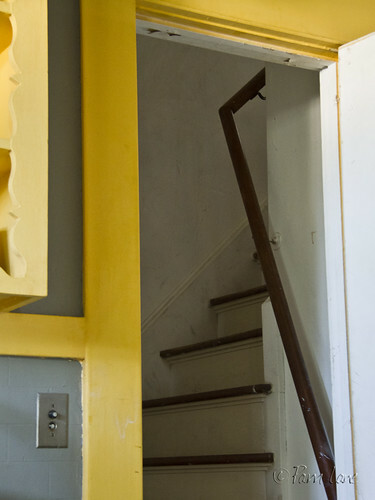 The narrow stairs led them directly down to the kitchen. I'm back at Tropicana and I can't decide. 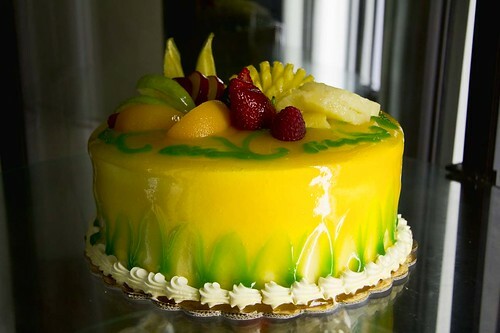 The cakes are so amazing... almost too pretty to eat. 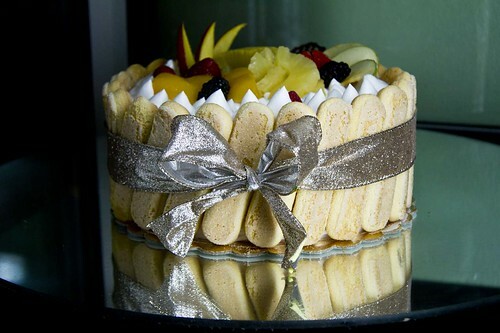 I curse my New Year resolution to eat healthy. Who can resist these beauties? I think I'm with Marie (Antoinette) on this one. 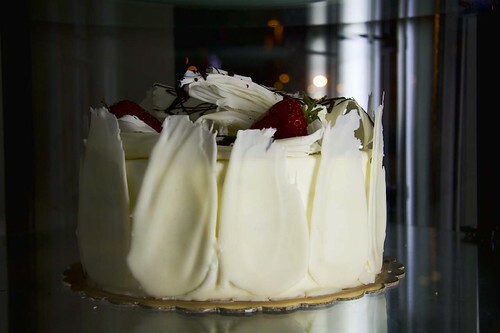 I say we should all eat cake! 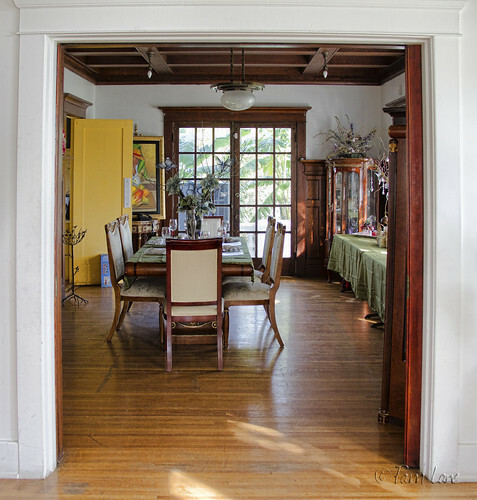 My first thought upon walking into the dining room in the Rives Mansion was, "I want to have dinner here!" 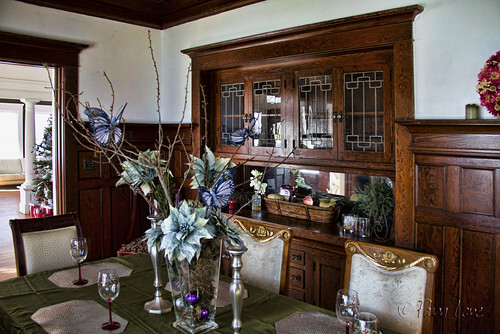 The rich dark oak paneling, the beautiful built-in cupboards, the original lighting fixtures up above, the elegantly set table, and the garden view through the French doors all combine to make the dining room one of the loveliest rooms in this old house. I read somewhere that a mermaid's tail splits in two when she becomes 30 and can then walk on land. This one was showing her age while pointing toward the heavens with her shell. 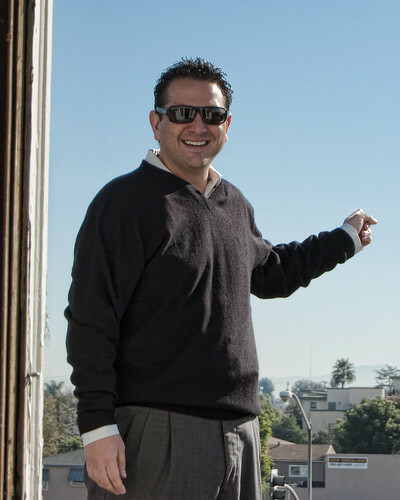 If ever you needed to know someone in this town, it would be Mr. Kirk Cartozian. Not only does he know just about everything there is to know about Downey, he can also name the houses we have been dying to check out all around Downey. 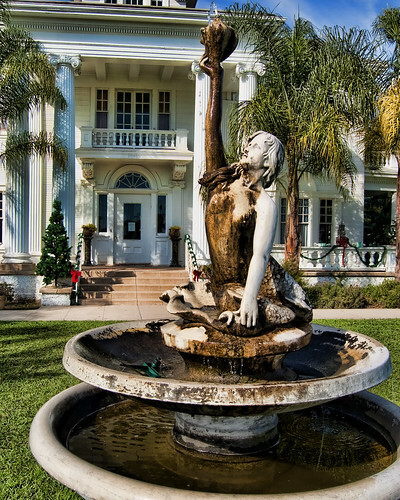 Downey has kept some of the turn of the century houses pretty much as they were and Mr. Cartozian has made it his business to get to know these families. He's invested a lot of time into it and has a lot to show for it. He loves Downey and it shows. It felt like we were his paparazzi. 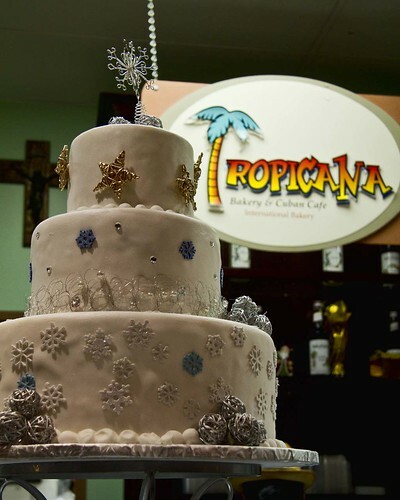 Tropicana Bakery and Cuban Cafe has been in Downey since 1999. It is charming and lively — always busy. 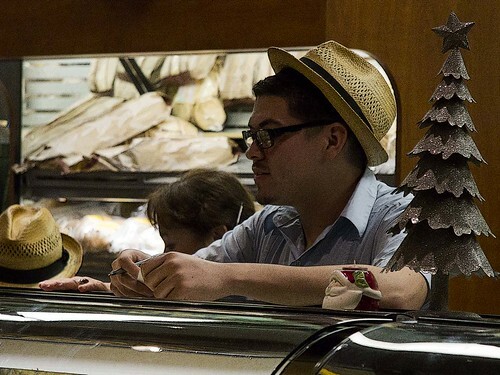 The service is prompt and gracious. I love the new "uniforms" with the hats! 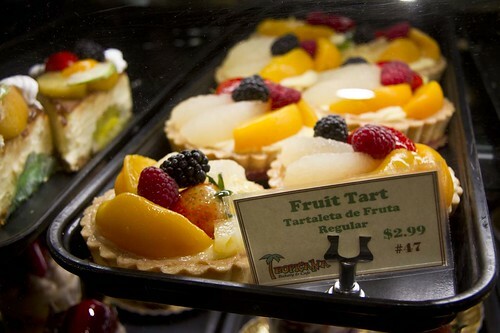 The hardest part of stopping by is deciding what to have. The desserts always get me... which one do I choose this time? I may have to stop by again later this week.